Only the scorecard-screen provides the Live leader board option menu item and only during current game, you can press it and go to live-leader-board-screen.On live-leader-board-screen, first press the "Find Round" to find if any round exists now.If found, click on the round found will join in the round.If not, press "Create Round" will create a new round and join it.After joining a round press the round-title on top of the live-leader-board-screen will refresh the current leader-board result. 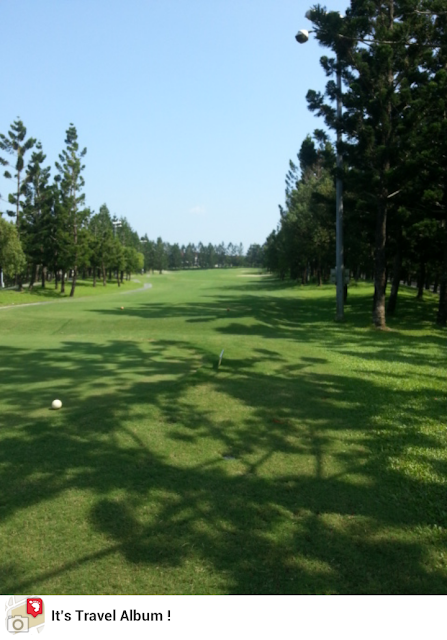 The round name is constructed by (1)date + (2)course name + (3)player name who create the round. Player created a round needs to notify other players the exact round to join. Below is the Find current rounds result, only the round created that day are found. 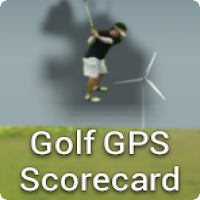 Golf GPS Scorecard - How to record shot, score ? How to record the shot, score ? From "main-screen" click "Start" will transfer to "scorecard-screen". If no game defined that day, app will pop up a dialog to let you input course name and player name to create a new game. Until you create another game or till tomorrow, you are always STAY in the CURRENT game. On scorecard-screen, click on the "Total", "Front 9" or "Back 9" title will show the total 18 hole items, front 9 hole items or back 9 hole items only on the screen. Camera SettingIn order to simplify the process of recording a shot, I add this to enable or disable camera on "my-shot-screen". But you can turn it on or off at anytime. From "main-screen" click "STATS", will transfer to "stats-screen" and show the most recent 3 games STATS.From "scorecard-screen" or "historical-scorecard-screen", press the option menu item "STATS" will transfer to "stats-screen" and show the STATS of that game. Record every shot withCurrent GPS position.Which club you used.Taking fairway picture from the view of current GPS position. 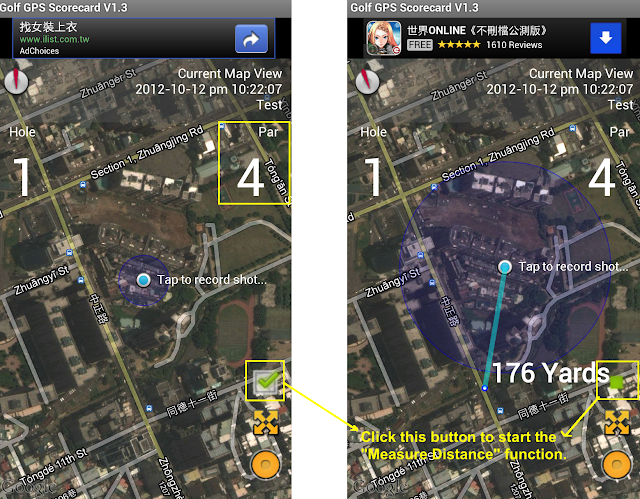 Calculate and show distance (with slope) between shots.Tracking and reviewing your every shot path by GPS position on "historical-map-view-screen". Searching your historical games ever created.Game STATS.Snapshot app screen and save it as .png file on phone for reference, for example, post on Facebook, sharing with friends, as your course reference and so on.Live leader board.Player map view , find player Geo position on "player-map-view-screen".Measure distance between current Geo position and the point user clicks on the "current-map-view". New featureAdd "player-map-view" option on "live-leader-board-screen" to let players in the same round see each other on "player-map-view-screen". 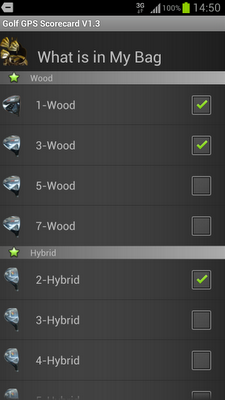 Add "setting-screen" option on "main-screen" to let user enable or disable camera on the "my-shot-screen" when records shots. Add new "about-screen" option on "main-screen".Enhance "scorecard-screen", add new "Front", "Back" or "Total" title bar on top of "scorecard-screen", click it will show only the front9, back 9 or total 18 holes.User interface enhancement Bug fixed.Run-time exception because did not enter the par number on "my-shot-screen".Failed to connect to camera service.To-do (maybe next version...)Simplify the process of "how to record the shot(score)". Add filter(date or course) to historical-game-list-screen. Golf GPS Scorecard - Setting of "What's in my bag"
Setting of "What's in my bag"
Only the club checked here will be shown on the "my-shot-screen" to pick up.